Originally published by the Smithsonian Institution Press, now distributed by the University of Alabama Press. From the jacket copy. 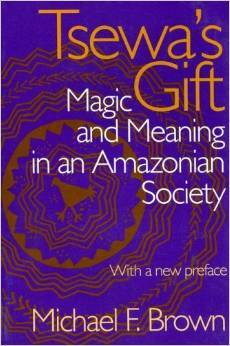 Magic has been a central concern of anthropologists since the emergence of the discipline. The apparently illogical character of magic confronts social science with a riddle: How can people with an eminently practical grasp of their surroundings—indeed, whose empirical knowledge is often astonishingly sophisticated—subscribe to beliefs and practices that seem to us self-evidently false? In this book, Michael F. Brown explores this problem through a detailed analysis of the uses and meanings of magic among the indigenous Aguaruna [Awajún] of northern Peru. Brown describes the socioeconomic setting of Aguaruna life and then explores the Aguaruna world view as embodied in magical songs and practices associated with hunting, horticulture, and domestic relations. He concludes with an epilogue assessing the changes that are taking place in Aguaruna society and speculates on the future of magic among a people who are increasingly obsessed with acquiring digital watches and polyester trousers. By thoroughly and sensitively exploring the philosophical grounding of the Aguaruna world view, Brown demonstrates the logic underpinning Aguaruna magic as a conceptual system. In doing so, he challenges a number of standard anthropological assumptions about magic, in particular the prevalent view that magic is based on expressive rather than instrumental intent.